The season premiere of The Voice last season (five) started off with Blake bringing all of his ‘Voice trophies that he had won so far to use as a weapon to lure new talent onto his team. This season, it was Usher that brought a physical prize to woo-over artists onto his team during the crucial first round of “The Voice” called ‘The Blind Auditions’. A Grammy! The other coaches- Adam Levine, Shakria, and Blake Shelton looked-on with sheer “why didn’t I think of that” type of reactions as they also boosted that they also had at least one of those at home. Button-pushers: Christina got all four coaches to turn their chairs for her. T.J. is from Los Angeles. Kristen is a 29 years old country singer. She said she came out of the closet at age 16. She wants Blake Shelton to turn for her. Adam stood-up at the end of her performance, and yelled “Welcome to Team Adam”. Adam also said, “It was so cool to hear your instincts.” He said he could tell that she sings for a living. Shakira said, “Social media is going to be critical in getting votes. She says she has 20 million Twitter followers. Blake said, “you have a very fast bravado. When Shakira hit her button, thought that’s who she should be with.” Shakira offered to call Miranda if Kristen picked her. Tanner is 16 years old. Although no coaches hit their buttons, they all gave him some good constructive criticism that he said he’ll use for his next audition. Adam told Tanner that he had a lot of courage coming out onto the stage at his age. He also told him, “think about when someone’s done listening to it we should all be in tears.” It’s not just singing the song, it’s living the song. Usher said to nourish his talent and hopes he comes back. Blake advised Tanner to strengthen his voice and his individuality (squeakiness) in his voice. At 45 years old, he’s a father of five with a baby on the way. Singing “A Change is Going to Come” by Sam Cooke. Adam said, “this is classic, this works. We all turn around because we all want to be a part of it.” Biff said he wants to be with someone who will take him all the way to the top. Shakira assured Biff, “I’m not so busy thinking about arrangements (referring to Adam’s wedding) and Usher is thinking about a movie.” Adam said Shakria has a baby. Shakira said motherhood has made here sharper. They met each other in a bar and discovered that they both sing. Shakira said, “I”m speechless. This has been the most special performance on ‘The Voice. It just embraces everyone around you. It shows that you are in love. You are going straight to the top.” She said she is also a producer and works on the staging of her talent included wardrobe. Leo is part of Diablo Dance Theater (company) which he joined after his stint in a boy band did not pan-out. Leo did some dance moves on-stage for the judges. Adam told him he is a ridiculous dancer, but advised him to hold-back on the dancing next time that he auditions. Jeremy is 26 years old from Sacramento. He said he was focused on baseball in school and became a coach after he graduated. He said it wasn’t working for him financially. He’s now working with the Unemployed State of Appeals. He plays nightly gigs and has never had any vocal training. Blake said, “Hello my fellow plaid-wearing friend!” He said he loved the way he was singing through the first verse. Blake told Jeremy not to look at Shakria, because it will be over. Shakira said “Minus the plaid-shirt factor. Consider – who’s the hungriest here? He’s (Blake) been here for six seasons,” and said she’d put all of her energy into him succeeding. Auditioned during season five of “The Voce.” Jake said, he will get a chair turned this season, calls it “Round 2!” Singing “Don’t Close Your Eyes”, by Keith Whitley. Adam told Blake, “I’m going to take Jake from you! Jake is mine!” Jake told Blake that he wans to be real rootsey singer when Blake asked him. Said when she sang a solo at the age of 11, she learned her level of singing. Karina went on the road with some friends after college. Karina said she’s no Christina Aguilera, and considers herself an Indy Artist. She also said her voice is different and hopes that coaches hear that. Bria is 17 years old and started playing music at 11 years old. She got connections to open for Miranda Lambert she said. Bria talked about the difficulty of balancing school and singing is managed very well by her Dad who retired from his job 3 years ago. She called him ‘the Swiss Army Knife for band managers”. Bria hopes for Adam to turn around. Button-pushers: Blake, Adam turned around at her first note. Shakira, then Usher followed. All of the coaches gave her a standing ovation at the end of her audition. Usher announced, “Ladies and gentlemen we have just hear ‘The Voice’. Blake went sweet on her and told her he’s a fan and will buy her records. 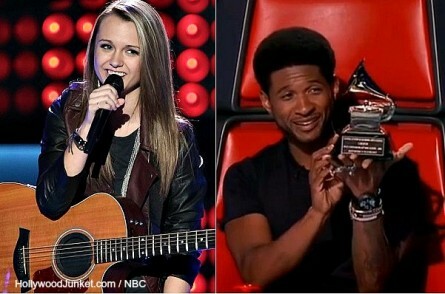 Usher said he doesn’t have a ‘Voice trophy but has a Grammy Award and pulled it out to show it off. He let her touch it. 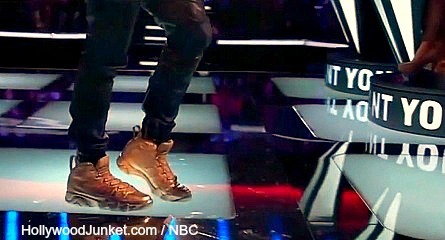 Adam said if you’re really good, you can turn your Grammys into shoes like Usher did! Watch THE VOICE season 6 episode 1 “The Blind Auditions Premiere” first aired by NBC on Monday, February 24, 2014. This full episode is now available at HOLLYWOOD JUNKET until 09/21/14 courtesy of NBC. ENJOY!